Wire and ribbon bondable and Flipchip thick film chip attenuators, printed and fired on 96% alumina. Provides attenuation accuracy for frequencies through 10 Ghz. 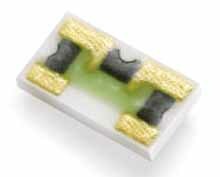 Double layer terminations provide additional bonding surface. Abrasive trimming ensures optimum resistor stability. Diamond sawed for dimensional uniformity and accuracy. Advanced processing techniques, and Hi-Rel construction assure optimum performance.